A Greenhound is not required by law to wear a muzzle when in a public place provided it is wearing the approved Greenhound collar, a tag and is secured by a leash being held by a competent person. The required tag needs to be attached to the Greenhound collar with the greyhound’s name and the owner’s phone number and/or address displayed. When a Greenhound collar is issued, it will include a tag engraved with the last six digits of the greyhound's microchip number. For no additional cost the tag can also be engraved with the dog’s name and the owner’s phone number if requested. A Greenhound is not required by law to wear a muzzle when in a designated council off-leash area unless stipulated by the particular council. However, the Greenhound must be wearing its approved collar and be under effective control on a leash by a competent person. If you do wish to pursue off-lead activities with your Greenhound, please ensure that it is in a fully fenced area, with their muzzle on to mitigate risk. 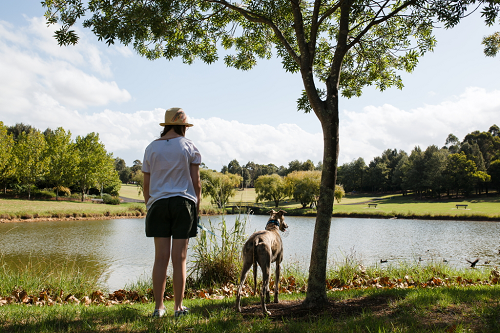 When in a designated council off-leash area, the competent person is responsible for controlling the Greenhounds behaviour which includes ensuring the Greenhound is not in breach of any other provisions in the Companion Animals Act 1998. For example, an offence may be committed if your dog rushes at, attacks, bites, harasses or chases any person or animal. Please also note that a Greenhound muzzle exemption can be revoked at any time if deemed necessary. Greenhounds strongly advises against letting a Greenhound off-lead in public and reminds all Greenhound owners that it is their responsibility as a dog owner to assess the risks and give careful consideration in determining whether to allow your Greenhound to be off-leash in a designated council off-leash area.